Tomato soup is one of the ultimate comfort foods in my book. I’ve got warm childhood memories of Campbell’s tomato soup sprinkled with crushed saltine crackers. I’m embarrassed to admit that I thought all soups came from a can, and it wasn’t until my early adult years that I realized that you could make your own from scratch. 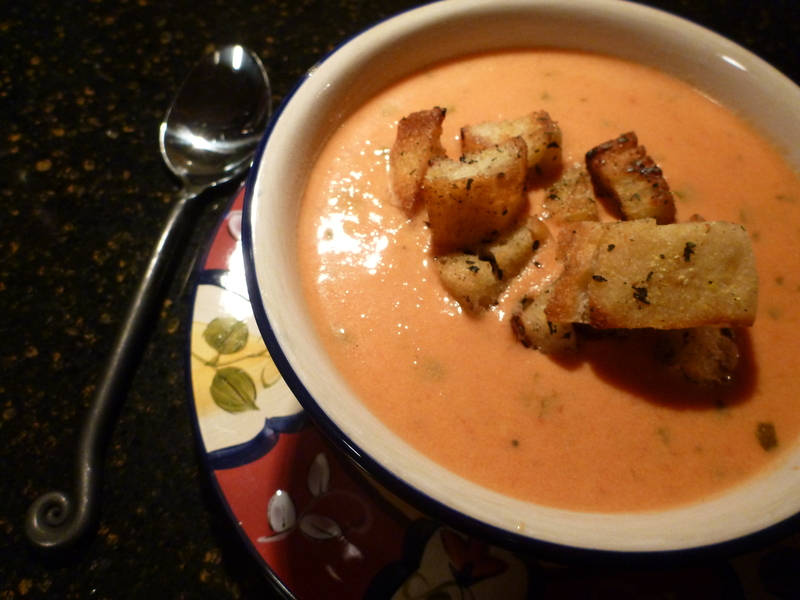 Lately, I’ve been addicted to this creamy tomato basil soup loaded with chunky homemade croutons. It’s super easy to make and the recipe makes enough for 10-12 generous servings. I’ve been freezing leftovers in small portion plastic freezer boxes to pull out and thaw when needed on those busy days. Heat olive oil in a large saucepan over medium-high heat. Add onion; sauté 4 minutes. Stir in garlic; cook for 2 minutes. Add basil and tomatoes; bring to a boil. Stir in cream cheese until melted. Place mixture in blender, and blend until smooth (you’ll have to do this in two batches). Return to pan; stir in milk, salt, and pepper. Return to medium-high; cook until nice and warm. Serve topped with croutons. 1. Heat olive oil in medium sized skillet over med-high heat. Add bread, sprinkle with seasoned salt and basil. Toss until bread is toasted and dry. Remove and cool. Save leftover croutons in air tight container or plastic ziplock bag.